Lakewood's Very Own Commemorative Calendar Has Arrived! The Lakewood Historical Society's 2018 Commemorative Calendar is here—and it's every bit as beautiful as we hoped it'd be! 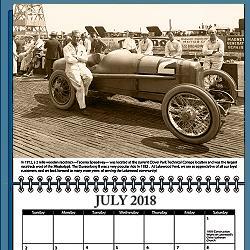 The historic photos—ranging from Thornewood Castle in 1911 to the Tacoma Speedway in 1922 to Selden Carpet's first home in 1959 to…well, nine more—are printed on thick, semigloss paper in rich, sepia-toned ink and securely wire-bound. In addition to dates of all the traditional holidays, plus events of local historical interest, the months have large squares with plenty of room to jot down important appointments, phone numbers, family events, etc. Handsome, practical, a boon to history and/or trivia lovers—our calendar is perfect for your home, terrific as a gift. Let your friends and relatives around the country see why you're so fond of our little corner of the world! Available now for just $10 at the Lakewood History Museum (6211 Mt. Tacoma Dr SW, noon to 4 pm, Wed-Sat) and at all our programs and events. If you prefer, call 253-682-3480 during those same hours and, for an additional $3 each, we'll mail you as many copies as you need. All proceeds go to funding our mission of identifying, preserving and perpetuating our rich local history. Don't wait another twenty years for an opportunity like this—get yours today!